1.Fix bug of can’t drag action from animation library after version 13.0111. 1.Fix bug of export EXE doesn’t work after version 13.0111. 1.Fix some bugs of freehand design. 1.set VP8 as default encoder when compress video(windows). 2.Fix bug of miss texture when import 3D model. 3.Fix bug of when play video still return to main slide. 4.Add reflection function for shape,text and image node. 5.Add animation event for table node. 1.add set transparent color function for image node. 2.Move nodes into a group from the hierarchy list. 1.Reload image and video when open slide. 1. Fix crash bug of export video with Google VP8 Video Codec(Windows). 2. Add option when import 3d model. 3. Fix crash bug when right click a image node that lose image file. 4. Fix crash bug when save project. 5. Add mouse enter and leave event to interactive. 1. Fix bug of some media file path(has character ” ‘ & “) don’t work. 1. Fix crash bug when import big dimension image. 2. Fix incorrect size of text when camera position changed. 3. Fix transparent node become fade when background is transparent. 1. Support selection of rendering engine(DirectX or OpenGL). 2. Fix a bug of undo. 3. Fix layer bug of image node. 1.Support image wall with transparent picture. 2.Support render to texture when export. 3.Reduce RAM usage if this program. 1.Support GIF animation in video object. 1.Fixed bug of default language is german. 2.Add external file to package or exe when export. 1.Add goto slide event to image wall and navigation. 2.Fixed double-click object trigger ‘Slide Show’ Event bug. 1. Fixed tutorial links broken bug in previous version. 1. Add line chart and area chart. 2. Open external file and program. 3. Optimize RAM usage when show image. 4. Support importing CSV in table and data graph object. 1. Fix a message box warning bug. 2. Add rehearse timings function. 2.Fixed the issue about grab thumbnail. 3.Each slide can set a video background. 1.Add more multilanguage(German, Spanish, Russian). 2.Software GUI support 1024×768 resolution. 1.Change cursor when play the presentation. 2.Add option of open folder when export. 1.Import more format model, like 3ds, obj, blend and so on. 2.Add tooltip action in interactive event. 2.Presentation can export a single executable file. 3.Add more video and image background. 1.Fixed a bug of play video. 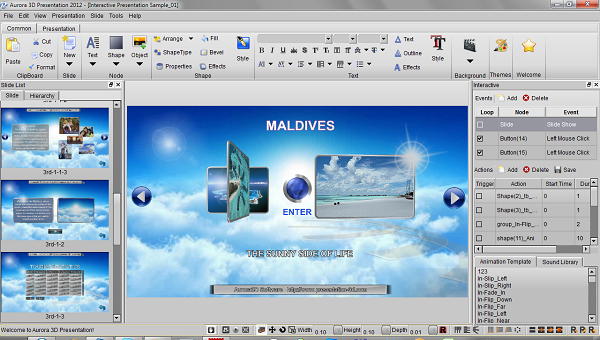 2.Add a sample of 3d presentation, Maldives scenery. 3.Add video type background, you can select a video background. 4.Add asian text file name support. 5.Add multi-texture support in the fill texture. 6.Support play action by wheel mouse. 1.Add multilanguage(english, franch, japanese, chinese). 1.fix the bug of can’t watch sample presentation file. 1.fix the bug of can’t save as package and save as play. 1.3D text can change different color in one node. 2.fix a bug of select particle. 3.fix a bug of change 3d model size. 1.Adjust UI and some spell mistake. 1.Fix a bug of text position. 2.Modified change background color immediately. 1.Fix a bug of text edit. 1.Add local user guide. If it doesn’t work,please download help(*.chm) file from our website(https://www.presentation-3d.com/download.html) and put it at the software install path. 1.Add links of video tutorials in welcome dialog. 2.Fix the unrecognizable code of asian code text. 1.Fix Presentation3DPlayer has watermark still when register Presentation3D. 2.Fix software can’t auto uptate bug. 1.Fix save as package bug. 2.Gix save as play bug when use skybox background. 1.Add new sample, please download new setup. 2.Add UI module, label and button. 3.Add interactive animate preview funcation. 1.Text,Shape,Image,Video and Model add Hyperlink. 2.Text add underline and strikethrough.